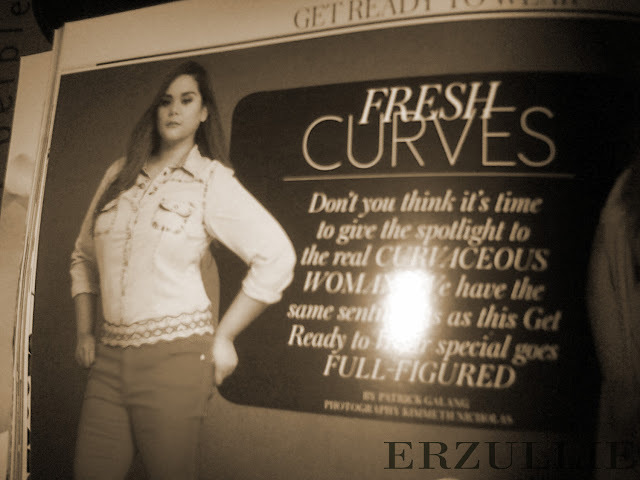 Erzullie Fierce Plus Size Fashion Philippines: PLUS SIZE FASHION: MEGA MAGAZINE FEATURES PLUS SIZE STYLE IN APRIL 2013 ISSUE! PLUS SIZE FASHION: MEGA MAGAZINE FEATURES PLUS SIZE STYLE IN APRIL 2013 ISSUE! When we received this tweet... excitement went all over our backbone! We were just so delighted in grabbing the next issue. Whatever it was, we knew that it would definitely be something that we are going to be excited about! So come April, I was able to finally grab a copy of Mega magazine with the beautiful Georgina Wilson on the cover. I have opened it and saw that the APRIL 2013 ISSUE FEATURES A PLUS SIZE MODEL. I am so happy! Just to be clear, the brand is not there and people may be all up saying, "Grabe naman itong si Aries, akala ko andun naman ang Erzullie." (With the way that you are acting Aries, I would have thought that Erzullie was there!) Lol. I know. I know. I apologize for that but as some of you may know, I am passionate about the local plus size industry. Anything that has something to do with a development of it, is a cause for me to celebrate! I have been celebrating since yesterday in twitter. Haha. Anyway, Grab a copy of Mega Magazine now to see the beauty! Here is a sneak peak! I didn't get to see the name of the model though. Whoever she is, she is an amazing person! What do you think? COMMENT HERE.